Mighty Mighty came to prominence with the song "Law" from the NME C86 compilation. They released a series of essential singles such as "Throwaway", "Everybody Knows The Monkey", "Built Like a Car", "Is There Anyone Out There? ", "One Way" and "Maisonette" between 1986-1988. After the release of their debut album "Sharks" in 1988 the band split but the interest in Mighty Mighty has remained high with 3 compailtions on the Vinyl Japan label and a career defining compilation "Pop Can!" on Cherry Red Records in 2013. AGMP are pleased to welcome back Mighty Mighty for a rare one-off concert in the heart of central London. Davey Woodward is a songwriter who has been a member of The Brilliant Corners, Experimental Pop Band, & Karen. 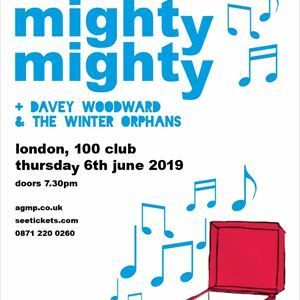 Davey brings his latest group Davey Woodward and the Winter Orphans to the 100 Club for the first time after the release of their 2018 eponymously titled debut album.